This is not the complete sonnet. Neither is it necessarily the best translation of Dante’s original words. It is merely one of the more direct and literal translations that one can find online (and it’s therefore easy to read). Fans of Ridley Scott’s “Hannibal” (2000) might recognize this as being featured in the film. “Alien: Covenant” (2017) is a first-rate sci-fi horror show with lots of monstery goodness. I am part of a happy minority where “Alien Covenant” (2017) is concerned — I keep hearing about “meh” or negative reactions from my friends, but I quite enjoyed it. I’d rate it a 9 out of 10. Michael Fassbender shined in his two roles here. (He not only reprises his role as the android, “David,” but also portrays a newer model, “Walter.”) The rest of the acting was roundly good too. I also found the movie nice and scary. I, for one, don’t think Scott’s direction of action scenes here is perfect. (They are harder to follow here, for example, than his beautiful arena melees in 2000’s “Gladiator.”) But they were still effective. So this return to form made me pretty happy. I didn’t want another muddled attempt at profundity like “Prometheus.” Nor did I want a winding, bizarre, arthouse-horror tale like “Resurrection” — that movie was like a poorly written, drug-fueled comic book. I wanted a first-rate sci-fi horror show with lots of monstery goodness, and that’s what I got. If I had to pick a criticism of “Alien: Covenant,” I’m surprised to have to point to some less-than-stellar CGI. This was something I noticed from early trailers for the film, and I’m surprised I haven’t heard another reviewer mention in it yet. One scene rendered a title baddie about as well as a modern video game, albeit a good one. Another’s depiction of an upright “neomorph” seemed … fairly bad. (Fans of decent creature features shouldn’t despair, however — there are still some outstanding monster moments, and no small amount of accompanying gore and goo.) Have I just become spoiled by the amazing dinosaur effects of 2015’s “Jurassic World?” I don’t think so … I suggest that the otherwise lamentable “Alien: Resurrection,” with its combination of CGI and practical effects, had far better creature effects than this newest outing. Of course I recommend this movie. Maybe I should only do so with the caveat that I am (obviously) a huge fan of the series. It has been said that I’m easy to please, too — I actually gave a glowing review to “Prometheus” shortly after its release, before wiser minds pointed out to me its sometimes egregious flaws. (A friend of mine shared with me one of those “Everything Wrong With” videos that CinemaSins produces … it’s a hilarious webseries, but it sure will dull the shine of some of your favorite movies, lemme tell ya.) Your mileage may vary, especially depending on how much you enjoy horror movies, as opposed to more general science fiction. I actually had more fun with this than I expected; the movie is much faster paced and scarier than the trailer made it look. There are some real surprises and moments of genuine horror here, following a requisite plot setup that is relatively brief. It’s a really nice monster movie that should please fans of the genre. I will say what the movie is not, however. One, it’s not a stealth prequel for Sony’s planned 2018 “Spider-Man” spinoff, “Venom” (though that’s such a clever idea, I wish I’d thought of it). Two, it’s not a ripoff of Ridley Scott’s “Alien” (1979). Yes, it’s got the same MacGuffin, and some story parallels that I noticed early on. But I like to think of this as a more grounded contemporary thriller, where “Alien” was a futuristic fantasy creature feature. Besides, if we criticize every “haunted-house-in-space” movie as an “Alien” imitator, we won’t get more of them. I’d give this an 8 out of 10, and I’d recommend it. Throwback Thursday: one ugly 80’s kid!!! This picture was taken at homecoming game, I think, at Longwood High School in Suffolk County, New York, in the very early 1980’s. This would have been the site of the “old” high school, at the end of Smith Road on Longwood Road, and not the “new” school building to which we moved in the late 80’s. It’s a good thing I wasn’t smiling here. Roughly half my body weight at the time resulted from my oversized teeth and gums, and that was not a pretty thing to look at. My school picture could have redefined the term “Gummi” in a categorically horrible fashion. I looked like somebody had cross-bred a “‘Nilla Wafer” with Ridley Scott’s “Alien.” Or maybe crossbred John Carpenter’s “Village of the Damned” with David Cronenberg’s “The Fly.” I’m serious. Young people, let me try to explain what it was like for a kid who loved movies in the early 1980’s. There was no trivia section for the Internet Movie Database. There was no Internet Movie Database. There was no goddam Internet. This meant that information about new movies came mostly from other second-, third- or fourth-graders. And that was one imperfect grapevine. 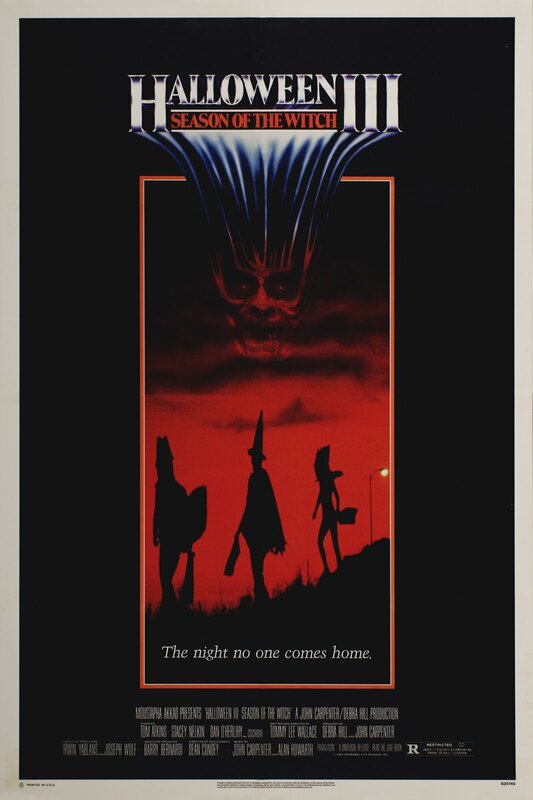 “Halloween III: Season of the Witch” was something of a different animal. None of the kids in the neighborhood could figure that one out. “Michael isn’t in it!” That was the buzz. To a boy in the 1982, Michael Myers was an icon on par with “Friday the 13th’s” Jason. (Leatherface was a bit before our time, and Freddy Krueger and Pinhead hadn’t arrived in theaters just yet.) Even those of us who weren’t allowed to watch the movies had heard all about him. It utterly confused us that that a “Halloween” movie could be made in which he was absent. But the gradeschool grapevine was not so informed. There weren’t even any tentative hypotheses among the kids on my street. I think we just shrugged it off and returned to talking about “Star Wars.” We just figured that adults sometimes did some really puzzling, really stupid things. That’s a belief I still hold today. In fact, I’m pretty sure that I occasionally engender that belief in others.